Dua is the summit of man’s perfection and freedom from worldly dependencies. It is the ring for connecting the lake of man’s soul to the infinite seas of divine grace and mercy. The sacred psalm of duas refreshes the soul of those devoted to God’s shrine and sheds the light of guidance over the hearts of lovers of Ahl al-Bayt (AS). The idea of developing a computer program for mystical supplications and dua books had occupied the minds of some Islamic software developers, until Computer Research Center of Islamic Sciences attempted to produce Noor al-Jinan with the intention of offering a grand computer program that suites the high concepts embraced in Islamic duas and distrusting the spiritual and ethical culture of Shiism. 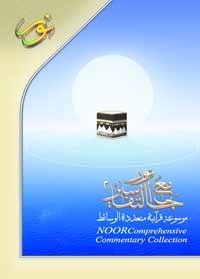 Noor al-Jinan is fragrant rosary of duas and ethical books in which the Holy Quran and som 67 main sources of duas, exegesis and translations of them have been contained. Other features of the program include ziyarat books with the possibility of synchronous display of text and translation and playing recitation of them, information about the books and biography of authors, tens of pictures and eulogies and elegies concerning the 14 Infallibles (AS) and other spiritual figures as well as playing of some supplications along with different religious pictures. Because of its outstanding features, the program was honored by the title “Servant of the Quran” (Khadim al-Quran) in the 9th International Exhibition of the Holy Quran and received the second place in the category “Multimedia software” in the First Islamic Sciences Software Festival as well as being praised in the 9th International Exhibition of Information and Culture. This software library contains the writings of Radi al-Din Sayyid Ibn Tawous in Arabic and Farsi which is developed by Computer Research Center of Islamic Sciences.